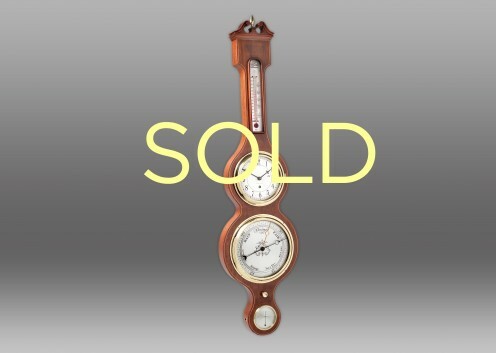 The Carver incorporates a 2 3/4" dialed high grade Selsi hygrometer, a 7 1/2" dialed aneroid barometer, a 6" dialed non-striking clock with an eleven jeweled lever movement and a vertical thermometer all flush mounted on a solid inlaid mahogany case with brass trim. Clock dial is hand silvered and features Arabic numerals as well as classic Banjo hands. A remote set knob is located below the barometer. Clock is marked with serial number 498615, and was sold to D.C. Percival on September 27, 1946.